I don’t have many cookery books (at least not compared to many of you), and I do not use the ones that I do have very often. There is one exception, and that is my collection of Biba Caggiano books. By now I’ve probably cooked the majority of recipes in there, but there are still some that I haven’t tried. 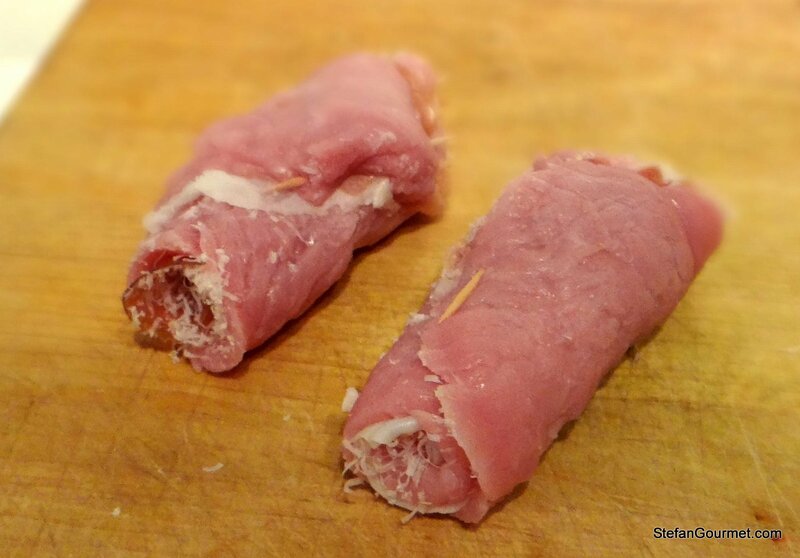 This recipe for fast stuffed veal bundles from “Modern Italian Cooking”, the first of her books that I owned and the one that got me started on Italian cooking, is one that I only recently tried for the first time. Perhaps because I thought it was too similar to Saltimbocca alla Romana, which is on the next page and one of my favorites. 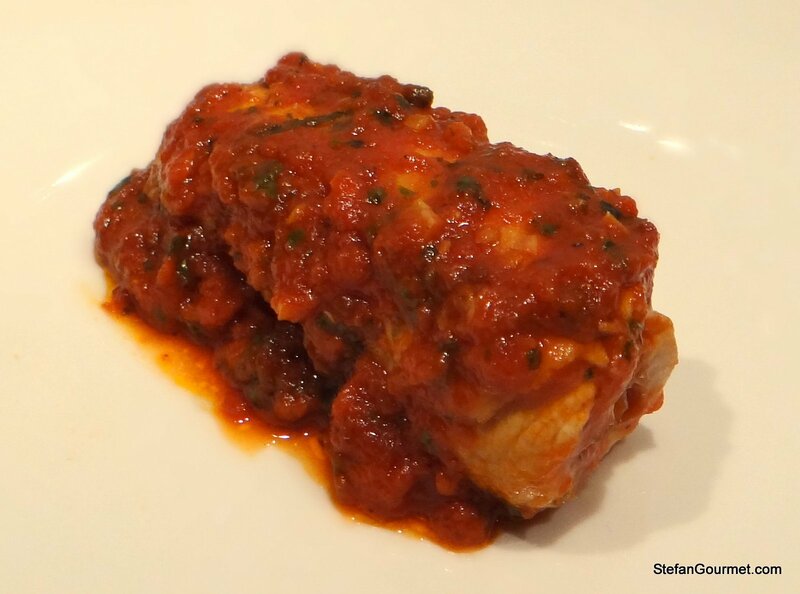 The main differences are that saltimbocca are never rolled up but always served flat, and that these stuffed veal bundles are cooked in a tomato sauce. They also take a bit longer to cook than saltimbocca. The result was very nice with a lot of flavor, although I did think the sauce was perhaps a bit strong for the delicate flavor of the veal. Next time I will try to substitute some of the tomato sauce with veal or chicken stock. You could also make these bundles with chicken or pork if you prefer. I made two adjustments to Biba’s recipe: I used clarified butter instead of a mixture of butter and olive oil, and I used pureed canned tomatoes instead of tomato sauce. 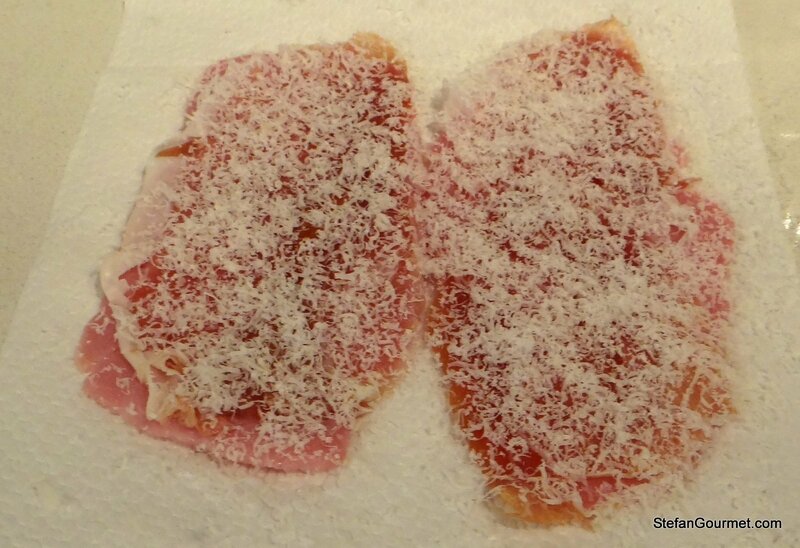 Cover the scaloppine with the prosciutto and sprinkle with parmigiano. Roll them up and secure with a toothpick. 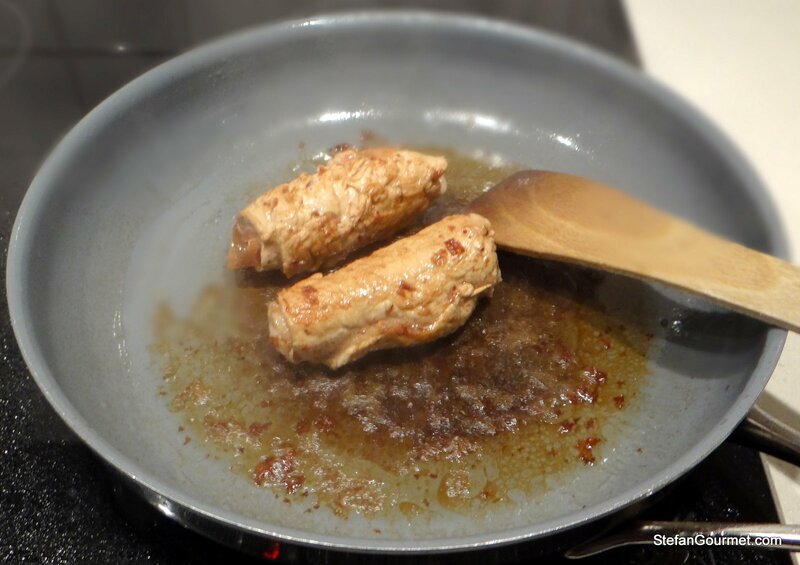 Heat the butter in a frying pan and brown the bundles on all sides over high heat. 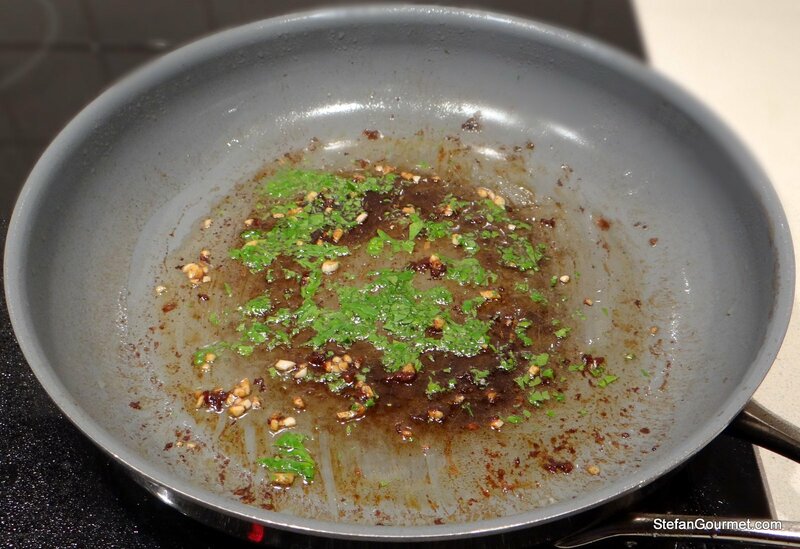 Deglaze the pan with the marsala. Scrape the tasty bits off the bottom with a wooden spatula while the marsala reduces. Lower the heat to medium and take the veal out of the pan and set aside. Add parsley and garlic, and stir for a minute. Do not let the garlic burn. 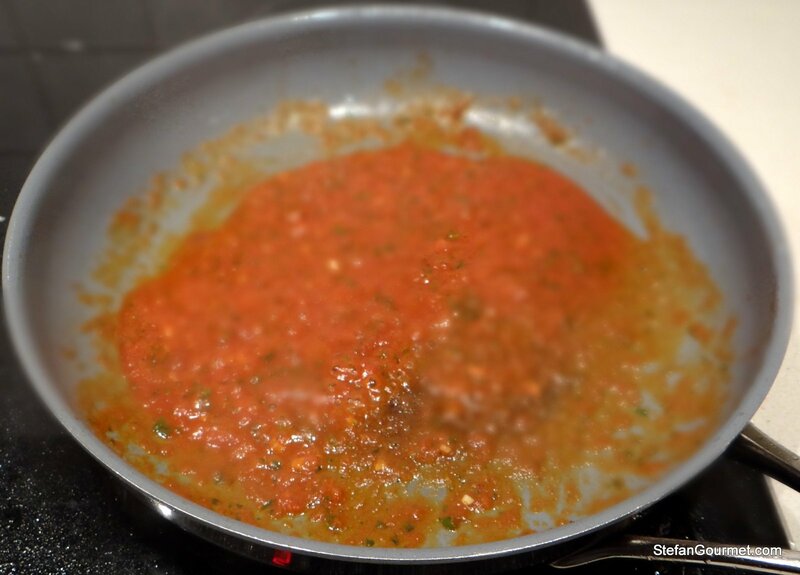 Allow the tomatoes to reduce a bit (this step is required because I used canned tomatoes rather than tomato sauce). Return the veal to the sauce. 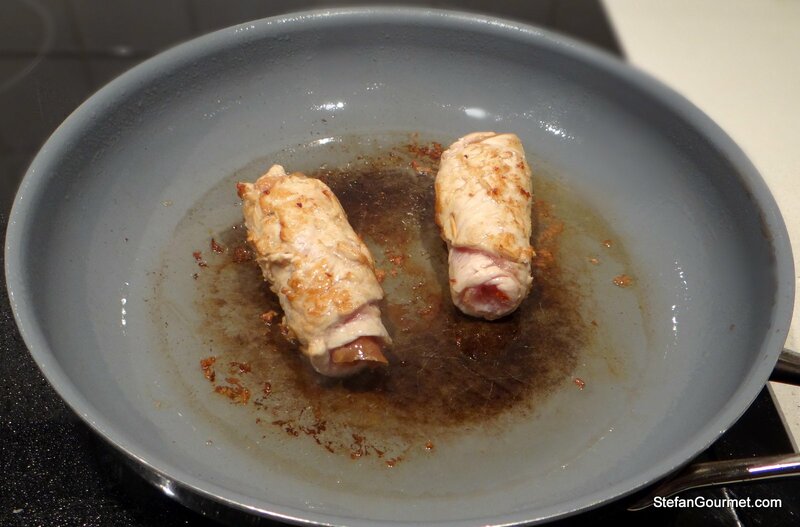 Season with salt and pepper and cook over medium heat until the veal is cooked through, about 3 minutes. Serve on warm plates. Do not forget to remove the toothpicks. A light Italian red such as a light Chianti would work well with this, or a hefty Italian white such as a Greco di Tufo. The wine should have good acidity to go with the tomato sauce, and enough body to go with the meat. A strong oaky red would overpower the delicate flavor of the meat, and may clash with the tomatoes. I would agree with you Stefan that the sauce might be a trifle too hefty for delicate veal … but I am sure they tasted lovely nonetheless. 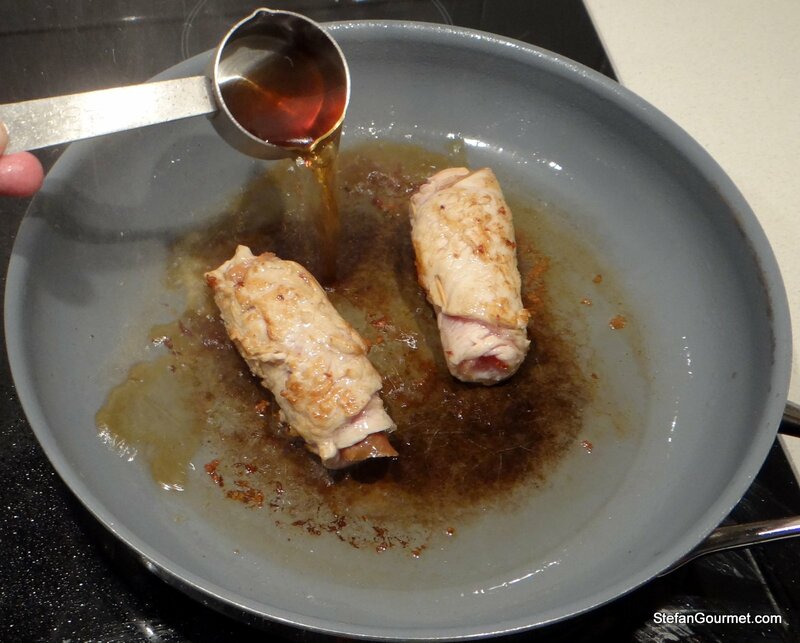 Involtini … or braciole as they can be called in the southern part of Italy … come in a variety of variations but this is the first time I’ve heard of veal being used. Usually they are braised for quite a long time too and that requires a ‘tougher’ meat than veal. 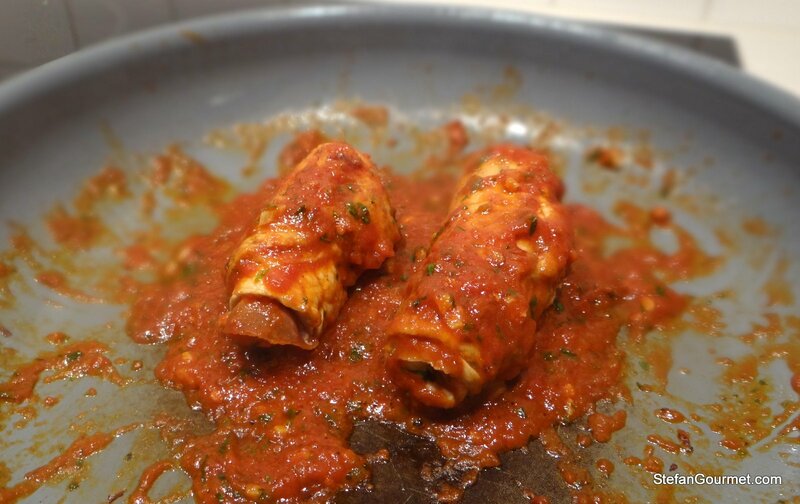 So I am curious to know where these veal involtini hail from … Does the Bibba Caggiano book say? Biba is from Bologna and it seems like a recipe from Emilia Romagna to me. This looks awesome!! When I lived in Malta, this was known as ‘braciole’ !! It’s more the quality of the books I do read than the quantity — unfortunately there aren’t so many good cookery books around. I prefer books that explain the reason behind techniques and combinations of ingredients than actual recipes. This gives me the building blocks to really know what I’m doing and construct my own recipes. Yes, this makes sense. You would very much enjoy the magazine “Cook’s Illustrated,” which is quite technical. Have you heard of it or seen it? Be well! I’ve heard of it, but don’t think I’ve ever seen it. I like involtinis too. My version is with parboiled asparagus, bel paese cheese, mortadella and some flour to coat. Don’t see the need for a sauce, let alone tomatebased, for a delicate cut of veal other than deglazing? I think I agree with you about the sauce, but since most of Biba’s recipes are great I wanted to try this at least once, too. 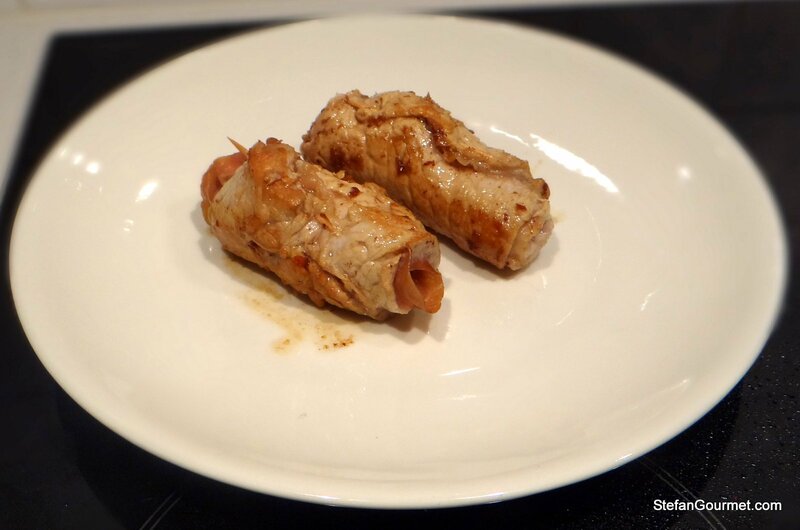 I have prepared Japanese involtini with asparagus, but no Italian version yet. That Biba has some fantastic recipes. You’ve picked a good one to share here, Stefan, and did a wonderful job preparing it. I should be going to bed but looking at that final photo has made me hungry. 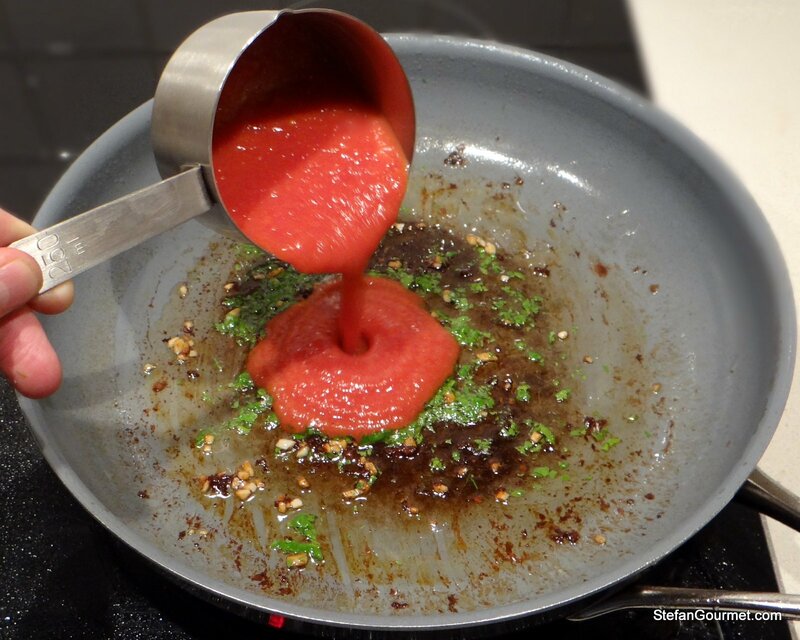 There is only 1 recipe that I prepare that I use canned tomato sauce. Thinking about it now, I probably should go back and re-write that recipe, eliminating the sauce. Hope you slept well after all 🙂 I don’t think Biba intended the use of canned tomato sauce, but home made tomato sauce instead. I usually plan my cooking so well that I never have leftovers and I have a very small freezer. Together this means that I generally don’t have tomato sauce to use for a recipe like this, and will just use canned plum tomatoes (also known as pelati in Italy).